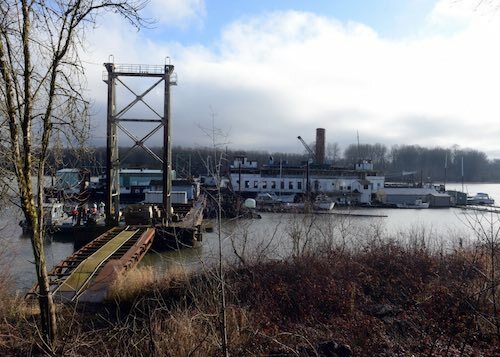 GOBLE, Ore. -- State and federal agencies have started cleaning up a site along the Columbia River that's been mooring derelict boats for years. One of those boats is the old "River Queen," which used to be a popular Portland restaurant. Clay Jonak leased the site near Goble in 2012 to restore the ferry. Officials said he brought in another two dozen vessels over the years. Three of them ended up sinking. According to the U.S. Coast Guard, two of the boats required emergency cleanups. Following a two-year effort to address pollution concerns, the state of Oregon took control of the site last week, and with the help of the Coast Guard, is now cleaning it up, removing hazardous materials like asbestos, lead paint and fuel. It was a move Georgia Ray has been waiting years for. "I've watched that thing rot in the river for a long time now and God only knows what's under it or what's come down river from it too," she said. Ray lives just downriver from the site. She said she's worried not only about her community, but also about the fish and other creatures that live in the river there. Roy Wall has worked at the Goble Landing for three years. He says any problems the site caused in the past have been cleaned up. "I have never seen anything come down here, other than normal debris that's on the river. No oil, no gas, no asbestos pieces, no junk floating down the river. Just normal river debris," he said. Jonak said he had tried to move the derelict vessels over the years, but because of current state regulations, he was unable to do it. They have also pumped off ten thousand gallons of oily water mixture and burned off 14 containers of propane. They say it will take about two weeks to remove the hazardous materials. After that, the Oregon Department of Lands will take over the site, removing any remaining vessels and restoring the area. Coast Guard Cleaning Up 'River Queen,' Other Derelict Boats on Columbia <-- Watch at Orginal Site.